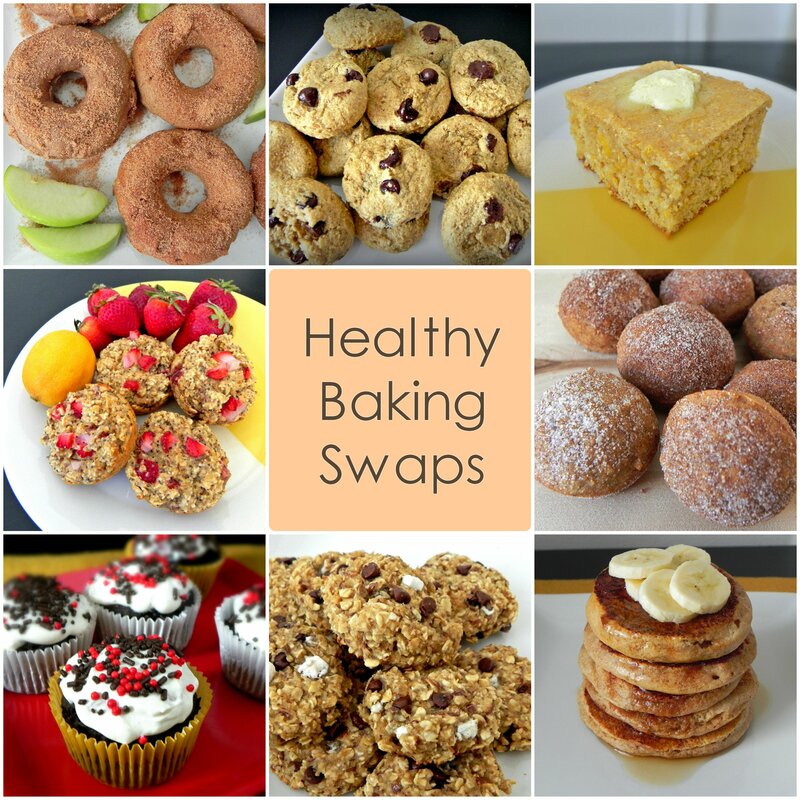 Rich and indulgent cakes, cookies, and brownies have a place in every healthy eating plan. To enjoy your favorite treats, here are several sneaky swaps you can make to cut calories and boost nutrition without sacrificing flavor. How: use as a 1:1 substitution for all-purpose flour. If you can’t find white whole wheat flour you can use whole wheat flour instead. Since the extra fiber content will make baked goods denser, use ¾ cup whole wheat flour for every 1 cup of all-purpose flour. How: Replace ½ of the wheat flour with oat bran by running oats through a food processor until they form a flour consistency. The extra fiber can help aid in digestion, stabilize blood sugar, reduce cholesterol, and increase satiety. How: Since nut flours are much heavier than wheat-based flours, substitute ¼ of the wheat flour for nut flour and increase the amount of leavening agent called for in your recipe. How: Replace ½ of the wheat flour with buckwheat flour for added fiber and protein. Since buckwheat flour is denser than wheat flour, increase the leavening agent called for in the recipe. How: replace ½ of the butter or oil called for with unsweetened applesauce. If you don’t mind a lighter texture in your baked goods you can use unsweetened applesauce as a 1:1 substitution. Works best in: any type of baking such as cookies, cakes, muffins, cupcakes, breads. Great for dairy-free baking. How: similar to applesauce, replace ½ of the butter or oil called for with fruit or vegetable puree. If you don’t mind a lighter texture in your baked goods, you can use fruit/vegetable puree as a 1:1 substitution. Bananas work best in breads, cakes, and muffins. Prunes work well in chocolate baked goods, coffee cakes, and cookies. Pumpkin and sweet potatoes work best in muffins, cookies, cakes, and dense breads. Works best in: dark baked goods such as brownies, chocolate cookies, and cakes. Great for dairy-free baking. How: mash ripe avocado and replace as a 1:1 substitution for the fat called for in a recipe. Avocados are rich in healthy monounsaturated fats which can aid in blood sugar stabilization, reduce inflammation, and increase satiety. How: replace ½ the butter/oil in your recipe with ½ plain yogurt of choice. The extra boost of protein and calcium is great for building muscle and bones, reducing blood sugar spikes, and increasing satiety. Works best in: most types of baking such as muffins, cakes, cookies, breads, and crusts. Great substitute for vegan baking. How: combine 1 tbsp of ground flaxseed + 3 tbsp water (let sit for 5 minutes to form a gel consistency) for 1 egg. Flaxseed provides an excellent source of omega-3’s and fiber. Works best in: most types of baking such as muffins, cakes, cookies, breads. Great substitute for vegan baking. How: combine 1 tbsp of chia seeds + 3 tbsp water (let sit for 5 minutes to form a gel consistency) for 1 egg. Chia seeds provide and excellent source of omega 3’s and magnesium. How: use a 1:1 substitution for sugar, but for every cup of applesauce, reduce the amount of liquid called for by ¼ cup. How: similar to applesauce, use a 1:1 substitution for sugar, but for every cup of puree, reduce the amount of liquid called for by ¼ cup. How: remove pits and run through a food processor until a paste is formed. Use 2/3 cup of date paste for every 1 cup of sugar. How: reduce the amount of sugar by ¼ – ½ cup and double the amount of vanilla extract. The rich aroma of the vanilla highlights the sweetness in your recipe without adding calories.